Are you wondering how to reach your potential clients? Do you struggle with communicating to people who could benefit from your expertise? Don’t stress if you’re feeling confused! You were trained as a therapist, not a digital marketer. So, it’s understandbale why you might be scratching your head. What is Strategy Consulting and how can it help your Private Practice? 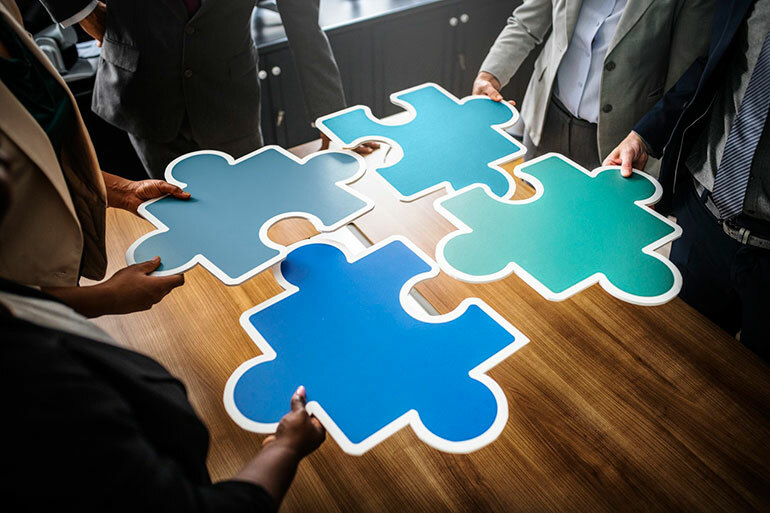 Strategy Consulting (SC) is for therapists in private practice who are looking for clients, but who are unable to find and connect with enough clients for reasons that they do not understand. There’s one basic rule in the digital world: if Google’s algorithm doesn’t understand what your website is about then it won’t show it to potential clients. And if you don’t show up on search engines then your site might as well be invisible. That’s where we come in. We speak on your behalf to Google’s algorithm, so that you can focus on speaking to potential clients. With Strategy Consulting, we analyze your current therapy site. But don’t if you don’t even have a website yet; it just means you could probably really use our help. We determine what is working and what is not. Then we meet one-on-one via phone or Skype and get to the core of what it is you do, along with your specific offerings. We then distill that message so that you understand what you really have to offer so that we can express that on the web for you. We do this by organizing your web navigation and pages into a coherent, clear structure. 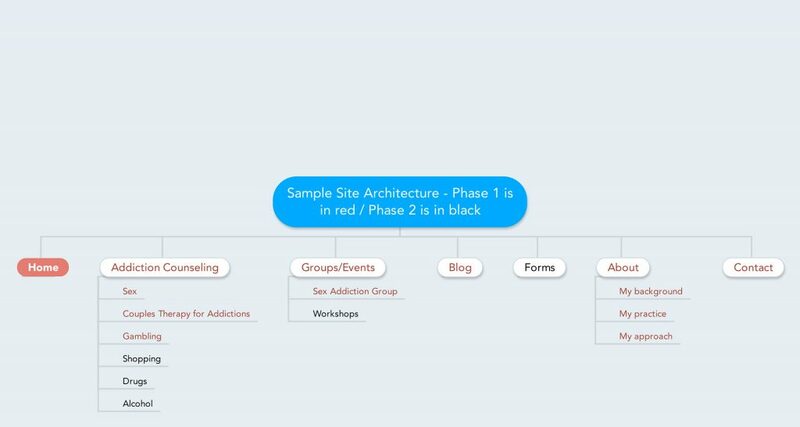 This is a example Mindmap, or site architecture, for a Addiction Counselor. Each therapist receives a Mindmap that best expresses their specialty. Of course, this is just a sample and every mindmap is different. Your mindmap will reflect exactly what your practice should emphasize. It’s all completely tailored to you and your unique practice. No other web company serving the therapist community offers this level of service. We’ve all been on websites that lack focus and organization. If you are like us, you did not stay long enough to figure out what they had to offer. You lost interest; they lost a customer. By contrast, when a site makes it easy to find what it is you need, you get straight to the page that is speaking your language (and your search term). Bingo! You stay, you read, you click around, you contact or purchase. Not everyone needs Strategy Consulting. In fact, we only recommend them to about 15% of our clients. If your focus is straightforward—say you simply specialize in the treatment of anxiety— your site navigation will be simple, and there is no need for SC. We only recommend Strategy Consulting if you’re not sure about your messaging, are confused about how to say what you need to say, or need help figuring out a complicated navigation structure. Strategy work is relatively in-depth, depending on your website size and specialties. The cost of our strategy consulting is a flat-fee of $650. This includes an initial meeting to discuss your desired direction, specialties, and any concerns you have; a proposed navigation architecture for your site; a keyword analysis; and a refinement phase that results in a final plan that you can implement with CounselingWise or on your own. If you are simply wanting us to do keyword research, you can learn more about how we can help on this page. Starting your therapy website with a well-planned strategy is key to attract not just visitors, but the right kind of clients. The goal of the SC is to determine what your specialties are, what to call them, and what order that they should appear in your site navigation. The more targeted and coherent you are, the better your chances of ranking in Google’s search engines, and the better the chances that potential clients arriving on your site can find the page that addresses their exact concern. Make sure what you have to offer your clients gets found by those looking for you, by building a bridge on the web that your clients can cross to find you. CounselingWise can help you do that. A good rule of thumb is… if you think you need SC you probably do! If you’re ready to get started with Strategy Consulting, click here. The Strategy Consulting is a flat fee of $650. Your flat-fee payment will cover your strategy work. Strategy work was very helpful. Kat laid out where we needed to go and the purpose and guided me through beautifully. It really helped me focus on what I needed to focus on and help give me direction as to what I wanted the site to be. This has been invaluable. It’s important to think about your site not only from your own perspective, but from a search perspective, which we don’t think about at all. Thinking about our potential clients and what they look for and how to appeal to them in another way… I really wish I had done this when we were starting out a year ago. It was a great win for me. I’ve used almost every aspect of CounselingWise’s services, and our practice is busy, compliments regarding our web presence and content are offered regularly. You can be the best therapist on the block, but if folks don’t know how and where to find you – what’s the point? How Many Specialties/Niches Should Your Website Focus On? 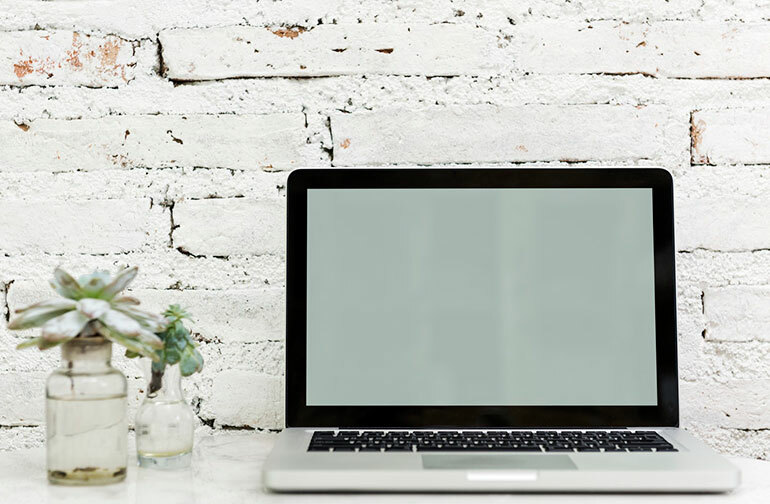 Why We Use Squarespace and WordPress for Private Practice Websites, and Why You Should, Too!